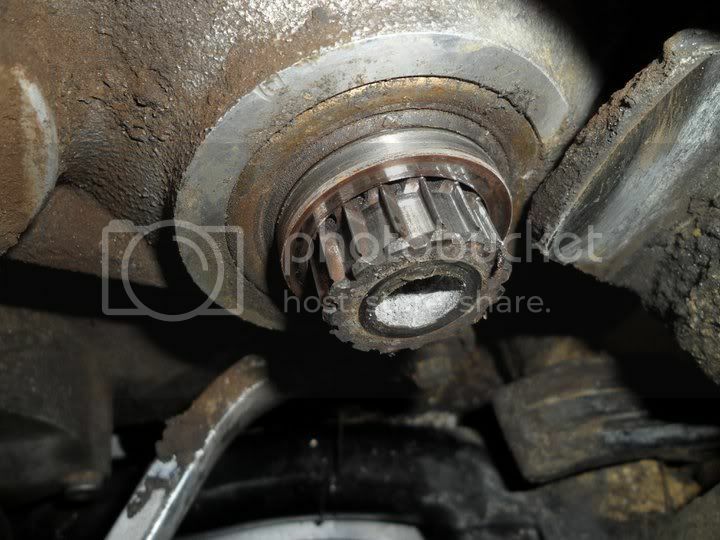 just did the countershaft seal at 7000 miles and with a cush drive hub. just a little wear on the splines but did a bit of reading and you can have rapid wear on these (and splitting the cases to replace the shaft). if doing a lot of miles and/or fair amount of road riding, evidence suggests a cush drive hub is a very good idea. 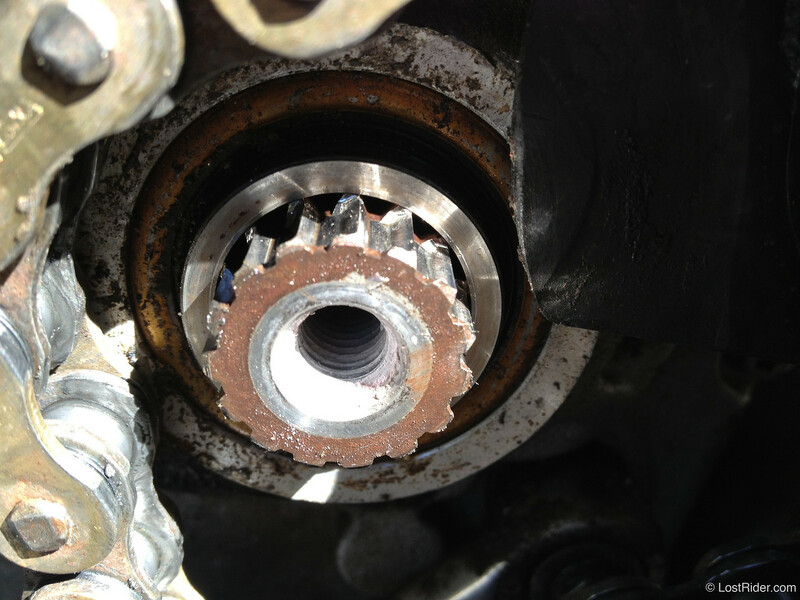 below is an FE570 after 12000 miles with 50% road use and no cush drive hub. - use a high temperature grease on the splines. hope no one minds, it's just in can keep editing it there to keep all the collective wisdom (or lack thereof) in one spot. With my throttle set-up like this I can comfortable have be controlling the throttle between 10/15%-70% throttle with my finger still on the brake lever.You try having your finger on the brake lever with your throttle open 70% of it's travel in your current throttle position. Ok... I like to use more throttle when I have my motard kit on compared to my enduro kit. Then I just grab my throttle more from the top, which bring the throttle handle into a more comfortable position when I use higher revs. No need to turn the throttle handle for that, unless you use the "husaberg" logo as some kind of reference? Sorry for keeping this OT, but the idea to turn a round shape around whould change the throttle angle is strange. Only your initial hand position do that. I took away the engine vent hose that goes to the airbox. It's routed that way so fumes get burned up instead of released (emission rules). I then plugged the airbox hole and run a garden hose from the engine vent down to the skidplate. I also installed a small check valve up high to avoid dirt or water to find it's way up as I sometimes go deep in water with my bike. I cut away the metal mesh on the airfilter frame. One experienced guy told me that when I give throttle on my 570 the oiled filter is sucked into that mesh and the mesh get temporarily restricted by filteroil. That's why your 570 might die quickly when you give it a quick rev. When the metal mesh is gone quick throttle responses will not have restricted air problem. I took it away and I haven't seen any problems with it so why not. I also bought a 390/450 version of the airbox as they have that nice funnel which helps to keep the dirt away when I change airfilter. A friend of me also say that that airbox will give some extra hp. Maybe, I don't know. I just did the clutch-mod where I took away the judder spring with friction disk and installed a normal full size disk instead. Now the clutch engages better and it's a much better ride imo! (I'm looking for a cush hub instead as the forces increases on the drive train and gearbox with this mod). The foot brake lever can work its way into the clutch cover over time OR in a crash. I took away the inner teeth on the brake lever as they are never in use and will only carve their way into the clutch cover. Now I have a nice round shape there. I cut up my fork protectors on the back side so I can take them off completely when I clean the bike. They work just as good. With a soldering iron I made small holes on the tank shrouds on the small edges around the airfilter to get more and fresh cold air in. If not most air is sucked in from the hole at the back. That air is warm from the exhaust. I also changed out my head lamp with two vision-x lamps and installed a IQ170 controller box so I could adjust the intensity http://www.husaberg.org/forum/viewtopic.php?f=6&t=17223 Comparison pictures will come after the summer as it's too light during the night now. + a few more I can't remember now or have already been mentioned in this thread (I made the subframe into a tank as an example, which is one reason to take away the small ball in the tank cap). Most mods are taken from this very forum, so thank you fellow husaberg.orgs! They stop stalling and lurching off the bottom after they are derestricted. My FS runs 100 percent better after having this done. Be sure it is also set to race map 4. Yes true about that plate. The bolt for the pump assembly can be quite sharp too. I filed the head of the one in the corner where the loom goes round. That one can easily cut through the cables. My dealer apparently has no idea what I'm talking about when I tell him I'd like to remap my FS 570 to "Euro Enduro map" or "Race map 4", or even the infamous "Akrapovic map"
Can anyone give more detailed information of what ECU maps are available, where dealers can usually get (download?) them, etc? I kind of went through this same thing when trying to get the Euro Competition map installed on my FE450. He said he has quite a few different maps but he only knows what 3 of them are (I guess those might of had names because he called them U.S., Euro Restricted and Euro) the rest just had numbers so unless you know the map number or your dealer is BIG into Husabergs, good luck. He didn't lead me to believe there was any downloading from Husaberg, it was more like their computer had all the maps already installed. Hey, great information here in this thread! I have a problem with my 2011 FE570, when getting hot it stops. I was thinking that the inline fuel filter might be the issue. Starting to look at the bike tonight but I can´t locate the inline filter. Is it inside the fuel tank? After the quick disconnect outside the tank, where the last bit of hose goes into the throttle body, the inline filter sits in the hose between it.